In today’s internet and cloud based society, our personal and private data is always vulnerable to external security threats when being transferred (i.e. sent by email). Unencrypted email is vulnerable to hacks and exploitation of information. Anybody’s email can be hacked or messages intercepted. You wouldn’t include private information on a plain post card and the same principle should apply to unencrypted email. Increasing cyber-attacks on business secrets, leakage of sensitive documents, identity theft, political espionage and mass-surveillance have all been increasingly in the spotlight in recent years. Despite this, most public, corporate and private email communications are still not protected with end-to-end encryption and can easily be penetrated by hackers and other third actors. EEZY KEYZ® protects your privacy and keeps your personal email data safe. EEZY KEYZ® makes end-to-end email encryption easy. It combines ease-of-use with uncompromised privacy and maximum security. Uncompromised privacy: There are no backdoors or general keys to hack in EEZY KEYZ®. It is a session and identity-based encryption solution. Each email, attachment, and even the metadata between users are automatically encrypted each time by the autonomous encryption software on user’s device with randomly generated session and identity based keys. This means that no email service provider, interceptor, or even EEZY KEYZ® staff member is ever able to see them. No email stored: EEZY KEYZ® is a true end-to-end encryption solution – the email is encrypted all the way from the sender’s device to the receiver’s device. The software handles the key exchange between users: email is always transmitted and stored by your email service provider. This means that no one except the sender and receiver can ever see the messages. We never transmit or store any message or have access to your email. Ease-of-use: User-friendliness is the main theme of EEZY KEYZ®. It runs the encryption process fully automatically. The installation is a simple few-step process which doesn’t require any special IT skills. After installation, sending end-to-end encrypted email to other EEZY KEYZ® users can be done with a single click. The idea is that the user can continue to use their existing email just like before but without worrying about privacy and security. 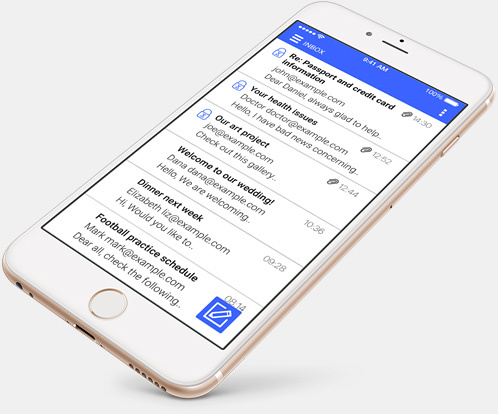 Our Outlook plugins and mobile Apps can be downloaded into as many devices as needed for one email address allowing businesses to safely adopt BYOD (Bring Your Own Device) -practice and users to securely and privately send and receive email anytime and anywhere. Compatible with all leading email services: Our software is a generic Cross-Platform encryption solution. It is compatible with all leading email services so users can continue to use whatever ISP and email service they prefer. EEZY KEYZ® allows users to send and receive end-to-end encrypted email between each other without the inconvenience of opening a new email account. It is available for Outlook, iOS and Android. Start your Free Trial now! Very strong session and identity based encryption: Our software utilizes the strongest encryption technology. It uses a unique (and patent pending) asymmetric and symmetric multi-key encryption technology (3×256 BIT AES and 1×3072 BIT RSA). Thanks to the session and identity based encryption each message is individually encrypted. This makes it practically impossible to hack the system. To do so successfully would require massive interception capacity just to open one single email for unauthorized scanning. Each individual email and its attachments is automatically and individually encrypted. Thus each email a user sends to a certain receiver is always encrypted differently. This applies to all email – every email is always encrypted individually. Messages are also saved encrypted so they remain secured in your mailbox on your device and in the cloud. All this is done automatically by the autonomous EEZY KEYZ® software on the user’s device. EEZY KEYZ® is not an email service provider so it does not transmit or store any email. We are never able to see any email or users’ private encryption keys. The session and identity based multi-key encryption technology is based on the combination of symmetric and asymmetric 3 x 256 BIT AES and 1 x 3072 BIT RSA algorithms. Thanks to the individual encryption of each message, EEZY KEYZ® end-to-end email encryption is unaffordable to even try to hack. EEZY KEYZ® is a true end-to-end Cross-Platform email encryption solution. It is available for Android, iOS and Outlook, and is compatible with all leading email service providers. Your EEZY KEYZ® account is linked to your email address, not to a specific device. You can install and use as many of our plugins and Apps as needed to protect email on all your devices simultaneously (limited to supported platforms). 1. User downloads and installs EEZY KEYZ® end-to-end email encryption software and links it to his email address. 2. User creates an EEZY KEYZ® account and enters his personal passphrase which is used to encrypt his private key. This passphrase is never revealed to us so no one other than the user has access to user’s key. 3. 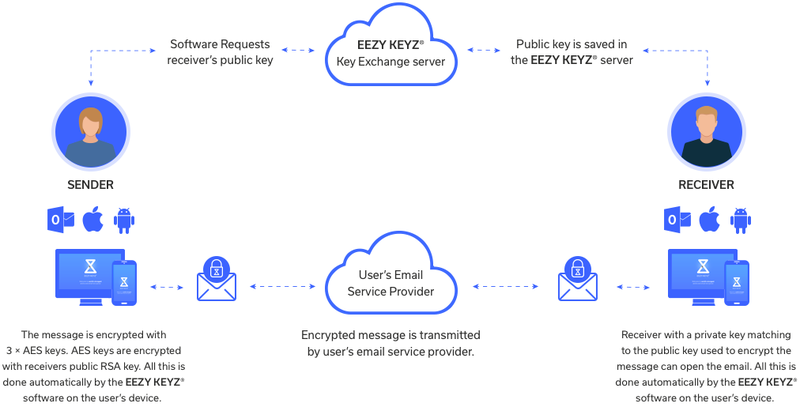 The software connects to the EEZY KEYZ® key exchange server and saves the user’s public key and the secret private key that has been encrypted using the user’s personal passphrase on the server. 4. User’s private key is encrypted with 256 BIT AES. 5. When sending email to another EEZY KEYZ® user, three 256 BIT AES keys are randomly generated by the autonomous encryption software on user’s device for encrypting email, attachments and metadata. The software randomly decides the order of the three 256 BIT AES keys. 6. The software requests the receiver’s public key from the EEZY KEYZ® server. The AES keys are encrypted with the receiver’s RSA key. 7. The encrypted email is transmitted by user’s email service provider. 8. A receiver with a private key matching to the public key used to encrypt the message can open the email. All this is done automatically by the EEZY KEYZ® software. 9. Receiver can read the email normally. And the best part – the EEZY KEYZ® performance is not theoretical promise – it has already been confirmed by numerous tests in world-leading cyber-security laboratories (VTT, F-Secure). Available for Windows 7 & 10. Available for Android devices (version 6.0 or later) and iOS devices (version 9.0 or later). Contact our sales for IT-managed solution for your organization’s needs!